Macore West African Cherry Hard Wood Long Handle, with Black and Charcoal Coloured suede Leather 10mm Falls Flogger. Macore is a West African Cherry Exotic hard wood used in this long handle, which is Melamine finished (Turned by a member of our team) to our own unique, elegant and sleek longer design at 15 inches length for more leverage during high impact flogging, then it's finished with an end black leather hanging cord and high quality screw fixed fitting. Falls are made from high quality suede leather hide. Falls are 10mm wide, 26 inches long, amount of falls 28 which are bonded and screwed into the inner recess part of the handle securely. Each of our floggers is custom made individually in our Essex workshop by Master craftsmen for the customer, and we are told that these are a very nice weighted flogger to use, which are quite thuddy. ** NOTE** We do not accept returns on Sale, Personal or Bespoke Items. 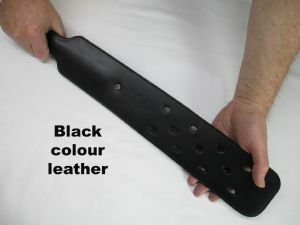 We have some complimenting stock of restraint cuffs, collars, and much more available in similar colour options of leather, please ask us about them or browse our store. We also have a very popular and discreet Bespoke Service available for the more discerning customers who'd like something a little different from what we currently list, please message us about your ideas and see them come to life!